Locate is a Cross platform GPS Based Social Mapping App which brings real time location of your Facebook friends & family members to keep you in touch with those whom you care for. Track your friends location on map with their consent. Search and share information about the place where you are, with your Facebook buddies. Get to know about some cool & popular places to hangout . Share your location with your near ones to let them know about your last location in case of emergency. Get location info of your friends on map at once. Get the detailed route information to navigate to your friends location. Supports real time location update to make your commuting easy & effective. 1. What kind of phone do Locate Support? Locate is a Cross platform App that Currently Supports Windows phone & Android. 2. How does locate works? Locate uses your phones Mobile internet, Wifi & GPS to get your current location and to send & share it with your freinds. 3. How to Add Friends in Locate? Locate has Add Friend option where you can add your facebook friends who are using locate. Locate uses your Facebook Data provided by you with your consent to suggest friends to add, also locate provides you a unique Pin which you can share with your buddy & ask them to add you in their Locate friends list and vice versa. 4. Can anybody see my location without my permission? You cannot be located without your permission. Anybody using the app will need to give us your explicit permission by installing our app and logging into it. 5. Do Locate collects any personal information about me? Locate collects some data about your current location & Facebook Credentials. We do not share sell or market your data to any third party. We Solely use it for product feature enhancement. 6. Where to get support Regarding Locate? We may collect your name, location, facebook credentials through Locate App which is important for supporting Locate app functionality. 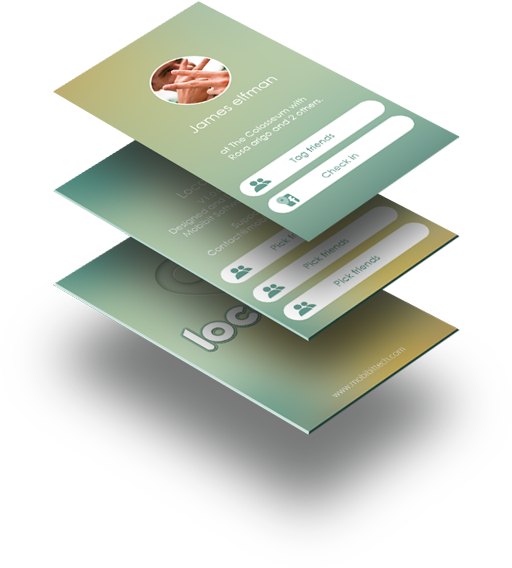 We may collect your name, location, facebook credentials through Locate App to enhance product utility & to improve our product quality based on your feedback & to intimate you about any of our products upcoming features & updates. 3. Do We Share Personal Data? Mobibit do not sell, trade, or otherwise transfer to outside parties your personally identifiable information. 4. How Do We Address The Privacy of Children? 5. How Do We Address Data Quality?